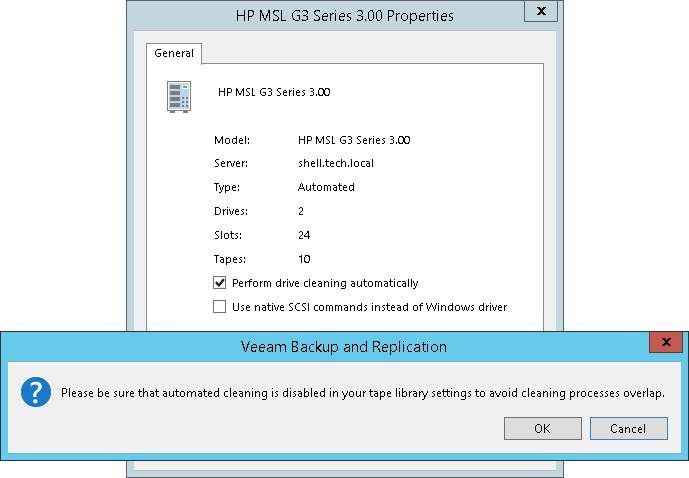 You can instruct Veeam Backup & Replication to automatically clean the tape library drives. Assigning the automated cleaning to Veeam Backup & Replication prevents possible overlapping of cleaning tasks and tape jobs. Such overlapping may cause tape jobs failures. Veeam Backup & Replication cleans the drives at the beginning of backup to tape jobs or file to tape job run. The cleaning is not performed during other tape operations such as, for example, cataloging or export. You cannot enable the automated drive cleaning on standalone tape drives. You cannot start the drive cleaning manually with Veeam Backup & Replication. The drive cleaning is fully automated.